I never realized how easy beets were to cook…I think those long stems always intimidated me. So whenever I made any beet recipes, I always used ones in cans or the precooked, packaged ones you can find in the refrigerated section at the grocery store. But once I discovered how incredibly easy they are to prepare and cook, I love using beautiful fresh beets! One of my easy, go to healthy beet recipes is this simple, yet very flavorful salad. The fresh mint complements the sweet beets perfectly, and the tangy goat cheese adds a hint of tartness to balance the flavors. Dressed in a light vinaigrette, this delicious Beet Salad Recipe is a fantastic Weight Watchers salad recipe that you can serve as a healthy side dish with a variety of main courses. I prefer it with a steak, or beef dish. Enjoy! This tasty and easy beet salad makes a great healthy side dish recipe to go with a variety of main courses. Fresh and flavorful, this sweet and tangy dish is a real treat. Steam until beets are tender, about 30 to 35 minutes. Let cool for about 20 minutes. When cool enough to handle, grab beets with a paper towel and slip off skins, then cut the beets into thin strips, and place in a medium sized bowl. In a small bowl, whisk together oil, garlic, vinegar, orange juice and salt & pepper. Pour over the sliced beets and toss to combine. Cover and refrigerate several hours or overnight. 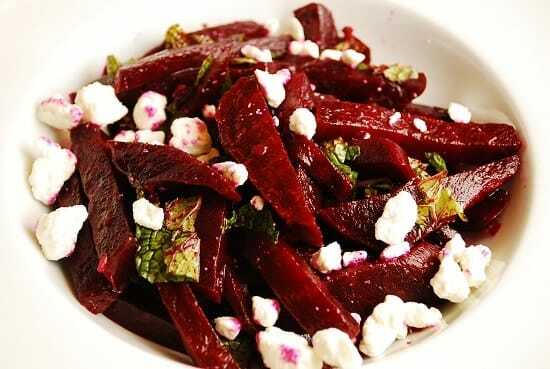 Serve beets topped with mint and goat cheese. do you cut off the greens before steaming?